When asked for a quote here is what I said for a recent CUCBC publication. This engagement, this interaction, is creating and changing the way we do things. But will we take the next step? Will we risk changing some core pillars in our institutions? Those that don’t will be left behind. Posted on April 30, 2007 Categoriesbits & piecesLeave a comment on What makes people generous? There are so many times you expect people to be one way and they are the other. Generosity is always a surprise. And because one is generous one day does that mean you’ll continue in that domain? It seems a lot depends on how you feel. Sure you can quickly weigh the obvious, that you can afford to be generous with your time, donation, or effort. But just because you can do something does that mean you will do something? There has to be more to it than just that. Maybe one is generous because it is a pretty big thing to help people. Maybe it is that sentiment, without guilt, that you are going to make a difference, no matter how small. There is no ideal for generosity. It comes from a purely human aspect of life. That is why I have difficulty when businesses or an entity other than human portrays themselves as caring or generous. An entity just doesn’t have those sentiments and in my wildest imagination never will. Next time you are generous think about it. It is something that only you can do at that moment. I was at the library and even Luke the Librarian is reading my blog. Wow! He is the one that should be writing blogs. Three very interesting books were brought home. 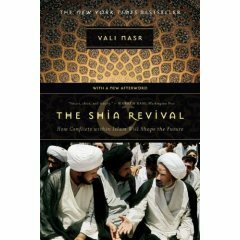 The Shia Revival by Vali Masr. How conflicts with Islam will shape the future. A Whole New Mind by Daniel H. Pink. Why right-brainers will rule the world. Six essential aptitudes – Design, story, Symphony, Empathy, Play and Meaning. Duct Tape Marketing by John Jantsch. Understanding how to end your small business marketing struggle (or how not to listen to the marketing flavour of the week). Last week the ‘renters’ moved out suddenly. They were there for such a short time we had only met them a few times and talked to them. The owner was over today. I sort of felt sorry for him as he said the place was a mess. Maybe that is why they left suddenly. I have been listening to ‘Cranely’s Gonna Make It’ by Broken Social Science on their ‘Feel Good Lost’ CD. This is a very interesting sound. Though it doesn’t sound exactly like the Feelies you get the same ‘moving along’ feeling when you hear this melody. A trombone and banjo for some highlights which is different. Someone named them experimental indie pop. A genre near and dear to my heart.